Every brand has a story, and animation is one of the best ways to tell it. That's why companies aren't afraid to pay a premium for professional animators to bring their brands to life and connect with their audiences. However, for those of us lacking the funds for a full animation team or the know-how to do it ourselves, Animatron Studio Pro has emerged as a beginner-friendly alternative, and it's on sale for $49.99 in the Boing Boing Store. Animatron Studio gives you the tools you need to create animations and graphics that will engage your audience, regardless of your technical know-how, and you can do it straight in your browser. 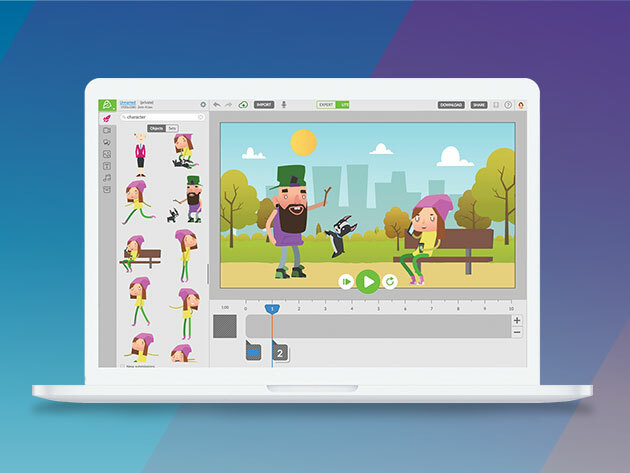 With Animatron, you can make explainer videos, design HTML5 banners and animations, and build stunning presentations while choosing from thousands of free, pre-animated characters, backgrounds and props. You can customize everything you want—from basic shapes to fully-animated characters and export to HTML5, SVG, GIF, and video when your project is done. Lifetime subscriptions to Animatron Studio Pro are on sale for $49.99, more than 90% off the usual price.